im new to this so please bare with me and excuse me if it has been asked previously or im in the wrong section but how does one go about getting their images on wave of the day on swellnets homepage? is it exclusively for swellnets photographers or can anyone sumbit a photo? is there certain restrictions that need to be followed eg file type and size. if you have a spare 5minutes please head www.facebook.com/southshoreco and check us out! How's this for a Wave of the Day? A surfing Llama? What unfortunate creature will be next hauled onto a surfboard? I'll get back to you to let you know if they'll run or not. 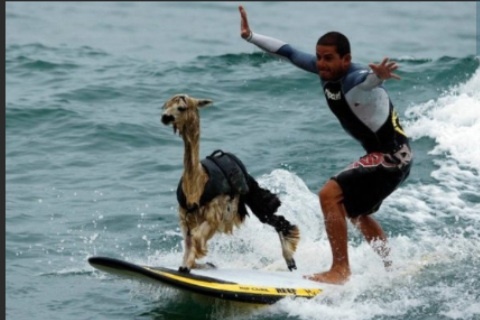 We don't run many shots of surfing llamas. Yeah Yorkessurfer there are some strange goings on in the world of surfing at the moment. For instance a mate of mine reckons he saw what looked like a palsied gibbon bouncing around on a board out at the back beach this morning ! Weird huh ? What makes it even stranger is that I was surfing out there all morning without even seeing another person , let alone a surfing monkey . What's he been smoking eh ? What impressed me most was the Llama's drop-knee technique then just to take it further casually lifting a front leg too! Why he needs a life vest on with that kind of confidence I have no idea? The llama's got better style than his partner that's for sure. I took a similar shot in NZ quite a few years ago, I'll try and dig it up. Went ot I Heart WOTD? Doesn't it conjure up a wonderfully relaxed mood? And that's despite it being one of the more fercocious waves on the coast. Pete said it's where he likes to hang and have an arvo beer while watching and shooting the waves. Micky Free baby wooooooooo in the green room! Sick shot today of Reef throwing it! Is that a key hole I see? Surely the first time a Carpenters lyric has captioned a surf photo?? Old mate went there in the late 70s, he has two whole photo albums of that wave. Each photo he's slotted, boring after the second page, not. Looks like that once small village is no more. The thing that stands out to me is despite the mess of losmens right next to each other, not far behind it is still fairly untouched, while when you are there it feels like the mess goes further back. Nias is pretty screwed up, but i think if the community all rallied together and agreed on things like building restrictions and code etc and worked together on re greening and landscaping and even bringing beauty back to the high and dry reef, Nias could really be changed in a positive way. What is also clear and i did notice last time i was there was the clear line where the land is being reclaimed, going to be interesting what happens here?...will it stay wasteland like it has in recent years, or will they build in front of other losmens?..or? Would be nice if they could replant coconut palms and landscape with that fine grass etc. Big wide walkway being built i think ? Are okay, i guess thats not a bad thing if done right, its far from it's natural state anyway. Nice friday the 13th wotd sn! is he ok....serious face plant coming up or crayfish dinner. What an Evil Growling 30ft Beast ! Yeh that would be my estimate too udo. The scary thing is that it was probably very surfable and running a long, long way. How is it, captures the late pumping sunset session amazingly well! The Cronulla guys were such a big influence in the 90s. Idolised the McKinley bros, and others there, as surfers. A lot of brilliant surfers came from that region during that time. That guy has been doing that since a long time before instagram, nice work! Six 4wds just out of frame for sure. Nice line up.